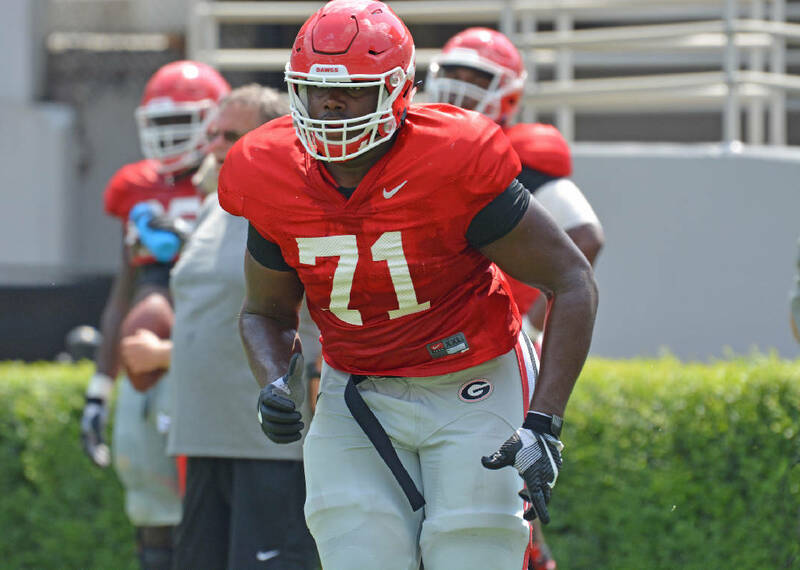 Freshman Andrew Thomas is getting looks at several positions on the offensive line with Isaiah Wynn out temporarily. Georgia senior left tackle Isaiah Wynn has missed the past couple of practices with an illness. That has made the second week of preseason camp somewhat intriguing for Bulldogs second-year football coach Kirby Smart. "The one guy we know what he can do is him," Smart said Tuesday during a news conference. "With him out, it allows us to move guys around, but we've moved more guys than we've wanted to these last two days with Isaiah's situation." Georgia held its eighth preseason workout Tuesday, going for two hours. Smart did not offer specifics on Wynn's illness, nor did he have a timetable for his return, but he did provide a list of who's been doing what where. Freshman Andrew Thomas has worked at left tackle, right tackle and left guard, while freshman Isaiah Wilson and redshirt freshman Ben Cleveland have been working on the right side. Junior Kendall Baker and redshirt freshman Solomon Kindley have been flip-flopping at both guard spots. Thomas and Wilson were top-10 tackle prospects nationally in the 2017 signing class. Georgia entered camp with a first-team front of Wynn, Pat Allen at left guard, Lamont Gaillard at center, Kindley at right guard and Dyshon Sims at right tackle. "The five guys who came out of spring are still ahead of the younger guys, but the younger guys are catching up," Smart said. The Bulldogs signed two players from Philadelphia earlier this year, running back D'Andre Swift and receiver Mark Webb. Swift was a top-five prospect nationally at his position after rushing for 1,564 yards and a staggering 10.5 yards per carry last season. Webb was a solid four-star prospect, and neither one appears to have disappointed so far. "We think those guys can help us this year," Smart said. Sophomore receiver Tyler Simmons (wrist) is running routes but is unable right now to go through contact drills, while freshman receiver and early enrollee Jeremiah Holloman is being held out with a hamstring injury. ... Smart said he and his staff are "almost through with installations." ... Smart was not up for making any comparisons when asked if his veteran defense had the potential of resembling some of the stout units he had as Alabama's defensive coordinator.